The Shawnees are an Eastern Woodlands tribe forced west by white encroachment. In 1793, some of the Shawnee Tribe’s ancestors received a Spanish land grant at Cape Girardeau, Missouri. When this area fell under American control after the 1803 Louisiana Purchase, some Cape Girardeau Shawnees went west to Texas and Old Mexico and later moved to the Canadian River in southern Oklahoma, becoming the Absentee Shawnee Tribe. The 1817 Treaty of Fort Meigs granted the Shawnees still in northwest Ohio three reservations. By 1824, about 800 Shawnees lived in Ohio and 1,383 lived in Missouri. In 1825, Congress ratified a treaty with the Cape Girardeau Shawnees ceding their Missouri lands for a 1.6 million-acre reservation in eastern Kansas. Then, after the Indian Removal Act of 1830, some of the Ohio Shawnees signed a treaty with the US giving them lands on the Kansas Reservation. In 1831, the Lewistown Reservation Shawnees, together with their Seneca allies and neighbors, signed a separate treaty with the federal government and moved directly to Indian Territory (Oklahoma). The Lewistown Shawnees became the Eastern Shawnee Tribe of Oklahoma, while their Seneca allies became the Seneca-Cayuga Tribe of Oklahoma. In 1854, the US government reduced the Kansas Reservation to 160,000 acres. This, plus the brutal abuses perpetrated against them during and after the Civil War by white settlers, forced the Kansas Shawnees to relocate to Cherokee Nation in northeastern Oklahoma. 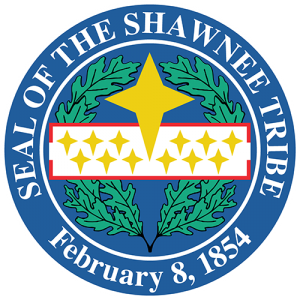 The 1854 Shawnee Reservation in Kansas was never formally extinguished and some Shawnee families retain their Kansas allotments today. The federal government caused the former Kansas Shawnees and the Cherokees to enter into a formal agreement in 1869, whereby the Shawnees received allotments and citizenship in Cherokee Nation. However, the Shawnees settled in and around White Oak, Bird Creek (Sperry), and Hudson Creek (Fairland), maintaining separate communities and separate cultural identities. Known as the Cherokee Shawnees, they would also later be called the Loyal Shawnees. The Shawnee are an Algonquian-speaking people. The Shawnee Tribe of Oklahoma offers Language Classes to their members. Tthe Shawnee Tribe of Oklahoma are a very resilient and proud people with over 2,200 enrolled tribal member. Ron Sparkman is the current elected chairman serving a four-year term. They offer many services and programs to their tribal members including; housing, childcare, and post-secondary education assistance. They also operate several successful businesses including a smoke shop, gift shop and gallery. It is estimated that their economic impact is $3 million.